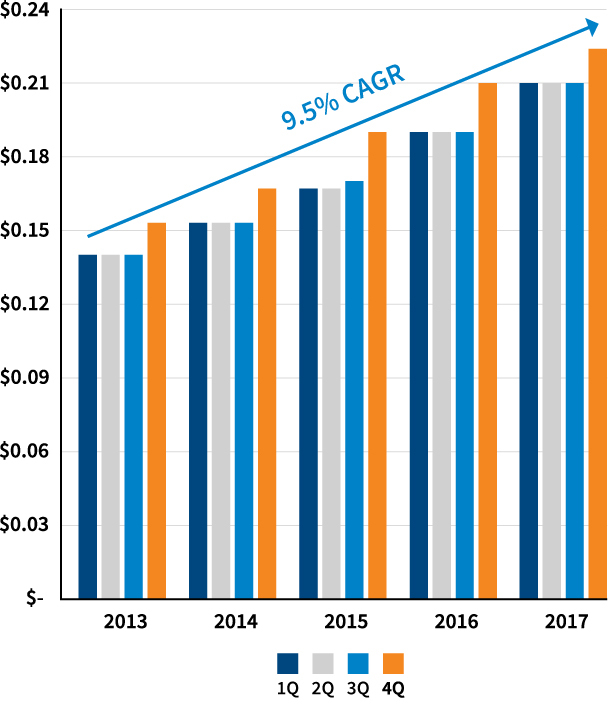 Investing in EMC Insurance Group Inc. is one smart choice. We have a diversified, seasoned book of business, access to a large capital base, a strong local market presence and an experienced executive management team. 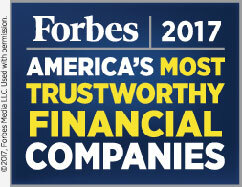 In addition, we deliver attractive returns to stockholders, pay consistent quarterly dividends and we’re recognized as a Forbes Most Trustworthy Financial Company. Select the tiles below to get to know our company, take a look at our business models and learn more about why you should invest with us. 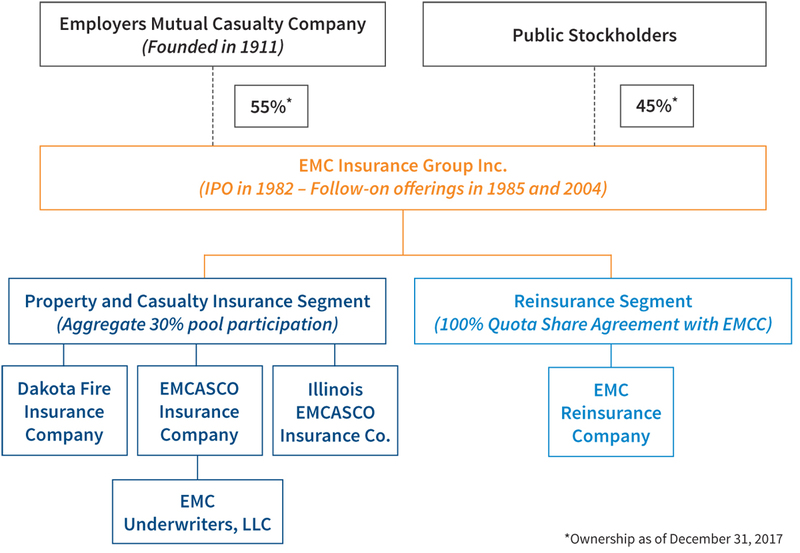 EMC Insurance Group Inc. (EMCI) is an insurance holding company with operations in property and casualty insurance (78% of premiums earned) and reinsurance (22% of premiums earned), which are its two operating segments. EMCI was formed in 1974, became publicly held in 1982 and is traded on the Nasdaq exchange. 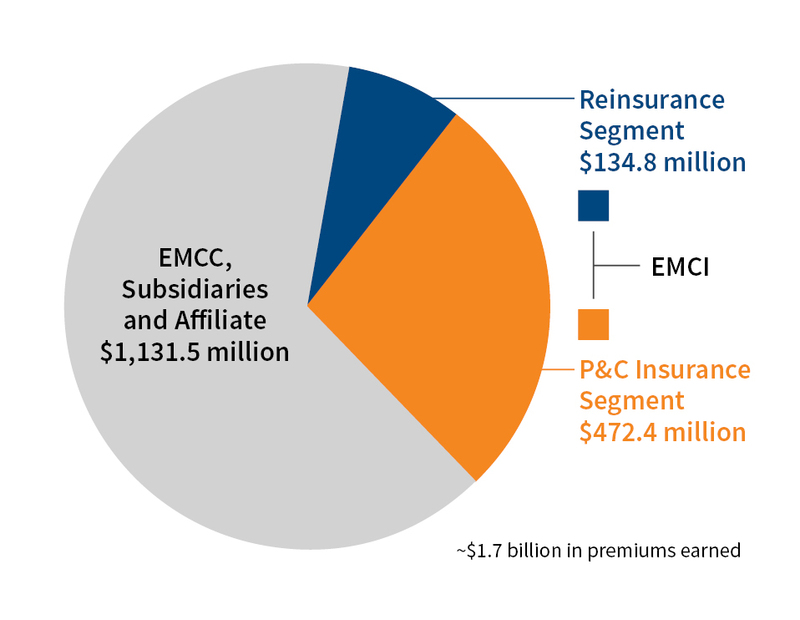 EMCI is a controlled company in that its parent, Employers Mutual Casualty Company (EMCC), owns greater than 50 percent of its outstanding stock. 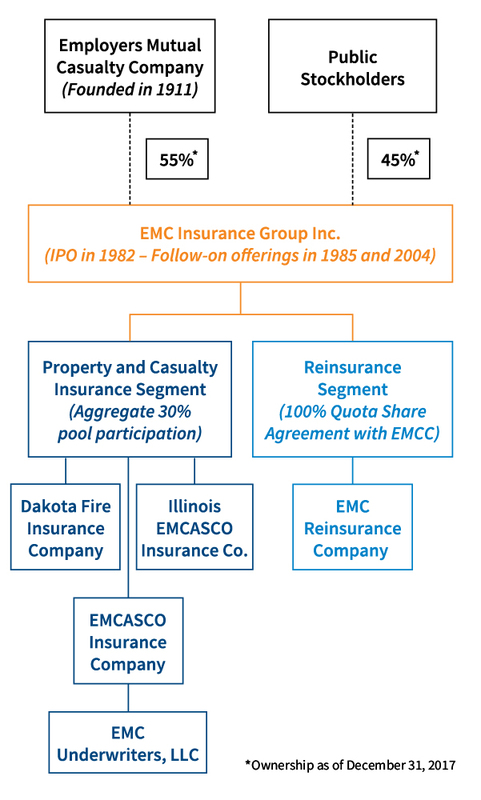 EMCC is a mutual insurance company founded in 1911 that actively markets its products in 41 states (licensed in all 50 states and the District of Columbia). 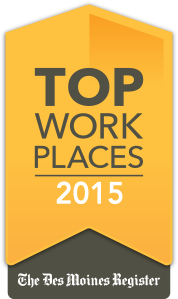 Headquartered in Des Moines, Iowa, EMCC employs approximately 2,375 people countrywide. EMCI and EMCC, together with each entity’s subsidiary and affiliated companies, operate collectively under the trade name EMC Insurance Companies (EMC). In addition to the fact that EMCI has a diversified, seasoned book of business, access to a large capital base, and strong local market presence, the company has an experienced executive management team. 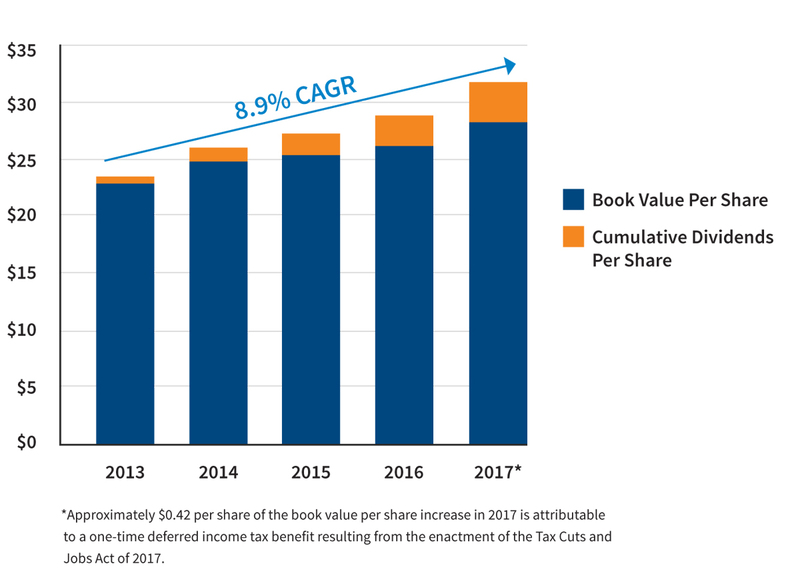 Other key reasons to invest include its proven ability to increase stockholder value and deliver a consistent quarterly dividend, and award-winning workplace. EMCI has paid a dividend quarterly since its IPO in 1982, and it has never been reduced. 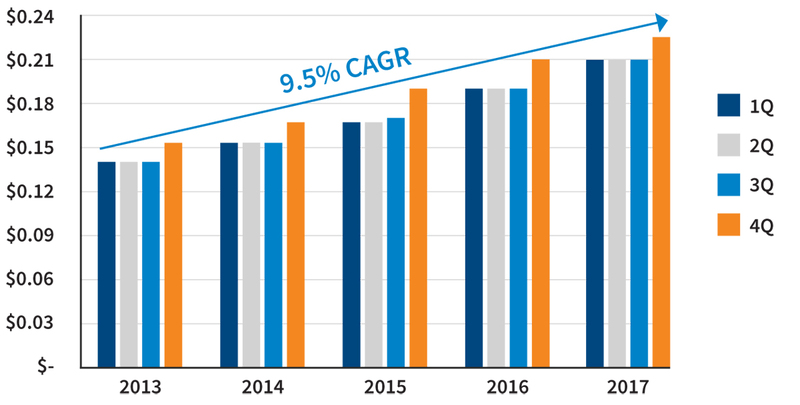 The quarterly dividend increased 4.8% in 2017, which was the eighth consecutive year that EMCI increased its quarterly cash. 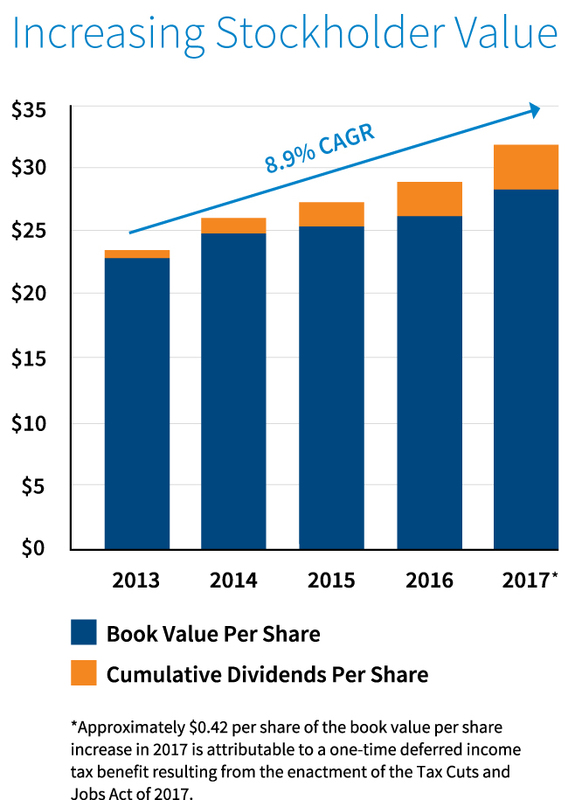 This reflects the strength of EMCI’s balance sheet and serves as an effective way to return excess capital to stockholders. EMCI has paid a dividend quarterly since its IPO in 1982, and it has never been reduced. 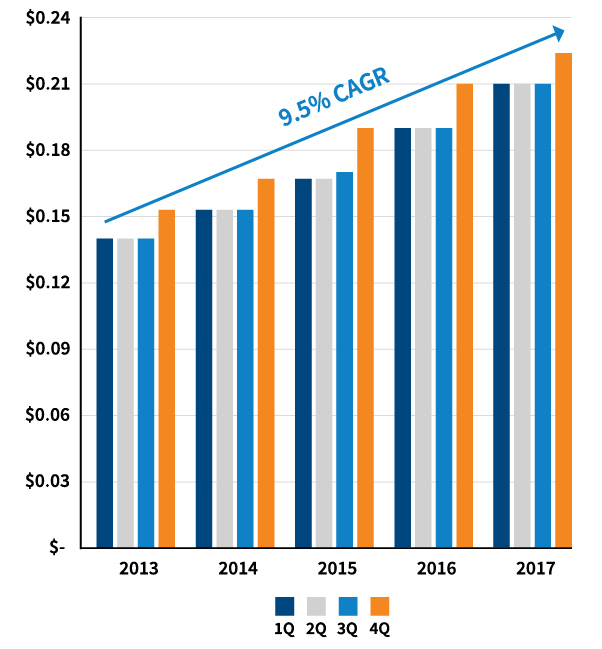 The quarterly dividend increased 10.5% in 2016, which was the seventh consecutive year that EMCI increased its quarterly cash. 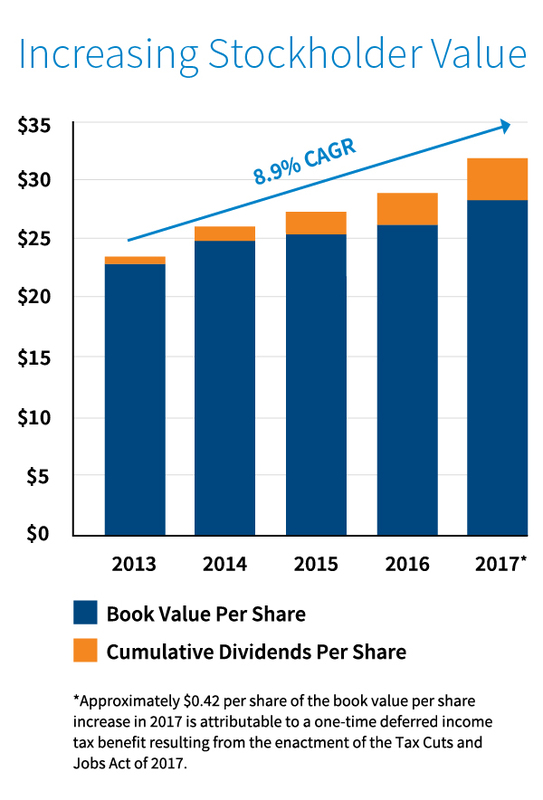 This reflects the strength of EMCI’s balance sheet and serves as an effective way to return excess capital to stockholders.